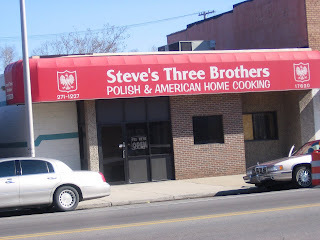 Anyway, I proclaimed Steve's Three Brothers (17820 W. Warren Avenue - (313) 271-1227) to be the Cool Warrendale Thing of the Week back in November. Since then, they have finally expanded their hours of operation. And that is a very cool thing for the Warrendale neighborhood. No one does pierogis better than Steve's. With the new hours, folks who didn't work in the Warrendale neighborhood can once again experience the wonder of Steve's cooking. The restaurant is open from 10 a.m. - 7 p.m. Sunday through Friday (closed Saturdays). If you've never been to Steve's, or if you haven't been in awhile, I definitely recommend checking the place out. Still no sat morning breakfast though. Depends on when you have breakfast. I can be a late riser when it comes to the weekends.